Currently, only New York and Hawaii offer these sorts of standard labor protections for domestic workers, which is a shame, but not a surprise. 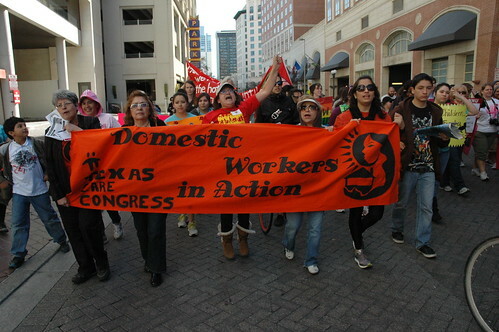 Many domestic worker arrangements are under the table and/or involve immigrants without proper work authorization, which has made this a difficult workforce to organize. If your boss can have you deported, you are less likely to agitate for better working conditions (or to report out-and-out criminal abuse). In addition, you would be hesitant to do the rabble-rousing that labor movements use to raise awareness, because any encounter with law enforcement is potentially the first step towards deportation. The victory in California is impressive for having overcome these hurdles, and the (mostly) women who organized support for this bill deserve great admiration and thanks. But the ultimate goal should be to remove these hurdles by granting all U.S. workers some measure of legal status, so they feel free to argue for basic human rights in the workplace.